KNRUHS MSC(Nursing) course Admissions Certificates verification, Web option dates 2017, Meirit List Results, Seat allotment List Results, KNRUHS MSC(Nursing) course admissions counselling. KNRUHS MSc(NURSING) ADMISSIONS FOR ACADEMIC YEAR 2017-18. Notification for first and final verification of Original certificates and Counceling for Admission into MSc (Nursing) course into Nursing Colleges affiliated to KNR University of Health Sciences for the academic year 2017-18. KNR University of Health Sciences, Warangal, Telangana State hereby notify that the first and final verification of certificates and counseling will be conducted for Admissions into MSc (Nursing) Course in Colleges under KNR University of Health Sciences, Warangal, Telangana State as per schedule given below on 05-11-2017 and 8-11-2017. The candidates whose names have been notified in the applied candidates list displayed on KNR UHS web-site are directed to attend First & Final verification of Original Certificates and counseling for admission into MSc (Nursing) Course for the academic year 2017-18 into the Colleges in Telangana State affiliated to KNR UH as per the schedule given below. SCHEDULE FOR CERTIFICATE VERIFICATION FOR MSc (Nursing) COURSE AT, JNTU, KUKATPALLY, HYDERABAD. 1.30 P.M. :: 201 to Last Rank. belonging to Telangana State and State of Andhra Pradesh are directed to attend for verification with all original certificates. Final merit position for admission into MSc(Nursing) Courses will be decided after verification of certificates and will be displayed on KNRUHS web- site on 06-11-2017. Counseling and allotment of seats will be done on 08-11-2017 at PGRRCDE, OU-CAMPUS, HYDERABAD. Candidates who completed verification of Original Certificates and whose names are displayed in the final merit list have to attend at PGRRCDE, OU-CAMPUS, HYDERABAD for counseling and allotment of seats on 08-11-2017 as per schedule given below. 3.30 P.M. :: 201 to Last Rank. 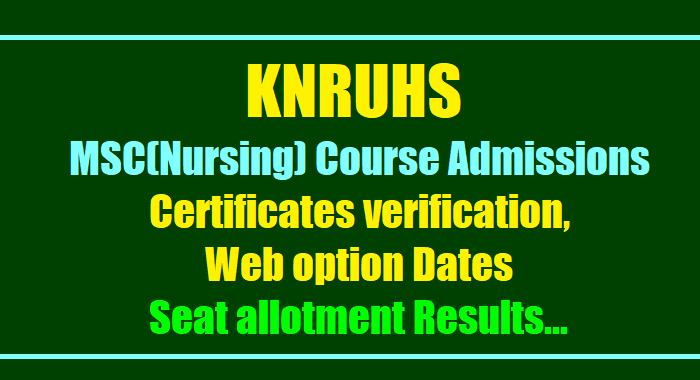 Candidates are advised to refer to prospectus and regulations regarding eligibility criteria for admission and other details displayed on KNR UHS web-site. Certificates to be produced at the time of verification : The candidates are directed to bring all the original certificates (mentioned below) and two sets of self attested Xerox copies. NOTE: CUSTODIAN CERTIFICATES ARE NOT PERMITTED. 2. Self Attested copy of Experience Certificate mentioning date of commencement and completion. 3. Self Attested copy of Provisional or Original BSc(N) 4YDC/2YDC Degree Certificate. 4. Self Attested Study Certificate from 10th to Intermediate. 5. Self Attested copy of study certificate of BSc (N)4YDC/2YDC Course. 6. If the applicant has not studied BSc (N)4YDC/2YDC in the state shall submit following certificates. 9. Candidates claiming eligibility about local/non-local should furnish relevant certificates in support of their claim. 10.Candidates who have studied in the state of Telangana / Andhra Pradesh. to Intermediate (Govt. ZPH/Private School or College) shall be submitted. b) A candidate who has studied in 2 or more institutions in various place in Telangana / Andhra Pradesh, study bonafide certificate from VI to intermediate (Govt/ZPH/Private School or College) in those places shall be submitted. c) A candidate who has not studied a class in any school / institution, a residence certificate for that period only shall be submitted. d) Candidate who have not studied in any school/ college in the state of Telangana / A.P., but resided in Telangana / Andhra Pradesh with private study in Telangana / Andhra Pradesh seven years residence certificate mentioning the period of residence preceding the qualifying examination (6th to Inter) by the candidate claiming eligibility as a local be virtue of residence shall be submitted. 11. Candidates who have studied in the institutions outside the State of Telangana / Andhra Pradesh have to submit 10 years residence certificate of the either of the parents issued by MRO to claim seats under unreserved category. Note: 1. Applications submitted without the above required documents shall stand rejected automatically. 2. All the originals shall be produced at the time of selection. 1) Candidates are informed this is the first and final phase of verification of Original Certificates. No further verification of certificates will be done. Candidates who got their Original Certificates verified only will be considered for counseling and allotment of seats. 3) Mere attending for verification certificates and counseling does not confer any right for admission as more number of candidates have applied for limited number of available seats. 4) Admissions will be done into MSc(Nursing) Course as per regulations of INC and Government of Telangana Rules.